Today Spick and Span went to West Dulwich, SE21, and cleaned a conservatory and glass roof kitchen extension for a family who are preparing to welcome visitors to their home in Dulwich. Spick and Span arrived bright and early this morning to the property in Dulwich with all the specialized conservatory cleaning equipment ready and prepared to clean the glass kitchen extension conservatory as well as roof both on the inside and on the outside. From the inside of the conservatory the outlook of the property had become dim and gloomy looking, because of debris and leaves and other grimy material that had settled on glazed panels on top of the conservatory roof, there was also glue marks left over from stickers that had been removed and muddy foot prints that the householders had on occasions attempted to remove in vain . On the interior glass of the conservatory were finger marks and stains and other marks that needed cleaning , which their toddler had made . 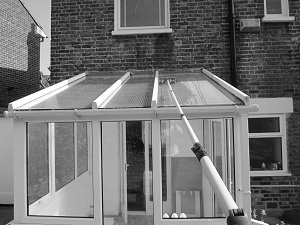 To get the right cleaning results ,Spick and Span used an extension pole and the purified water method of cleaning, rather than traditional window cleaning methods on the conservatory roof glass, as this enabled the window cleaner to aggravate the dirt that adhered to glass on the roof top, also the bristles on the brushes that the window cleaner used were mono-filament, these were used to effectively lift off the grime . The windows were then rinsed with purified water, the water then left to evaporate. The end result of this was that the conservatory roof glass panels were all left gleaming, the only marks which remained were some spots left by the oil based glue this was scraped and rinsed. When cleaning inside it was vital that no water damage be caused. To prevent water damage inside, when the conservatory roof was cleaned, dust sheets were put down below areas of work and furniture and children’s toys were carefully moved out the way. the large glass panes that bounded the conservatory were cleaned with a window cleaning pad and squeegee and all remaining water marks and spots were rubbed with a damp cloth. After all the tools were gathered up and packed away into the work vehicle. the work was inspected to ensure that it met with standards, and an arrangement was made to maintain the appearance of the conservatory and come to give it a clean once every three months.